When Should You Stop Eating Before Bed? 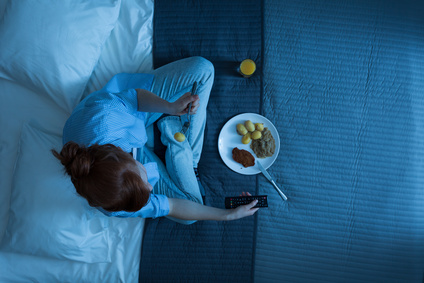 With today’s hectic schedules it can be difficult to plan your routine as ideally as possible, but when should you stop eating before bed? You may have heard a number of theories about how this can affect your weight and ability to sleep (some of which are true, and some which aren’t supported by evidence), so in this article we will take a look at how eating soon before bed will affect you and, as a result, how long you should wait after a meal before going to sleep. Eating is a vital process to keep yourself fit and healthy. It’s the way your body receives the things it needs to function properly, whether it be for energy, or crucial vitamins. The food doesn’t immediately provide these nutrients, though, and needs to be broken down before they can be used. This begins as soon as the food enters your mouth where you chew it, but the main work is done in the stomach, and this can be quite an intensive process. The time it takes for food to be fully digested varies from person to person, but studies have concluded that it will take between six and eight hours for it to pass through your stomach and small intestine, before passing into the large intestine. Digestion takes a relatively large amount of effort by your body, and also generates a lot of heat. In a similar way to eating, sleeping is also a fundamental process to our well being, and provides our bodies with an opportunity to relax and recover from the previous days activities so you will wake up refreshed and ready to go. An important part of sleeping is the ability to divert blood flow to organs like the brain and to give other organs that are active all day a chance to rest. With all of this in mind, it is then a logical question to ask if it is OK to eat before going to bed and, if you do, what effect that has on your ability to digest the food and sleep. A lot of advice given by diets will recommend that you don’t eat close to bedtime because they claim you will put on weight. This isn’t exactly true and there is no direct evidence to support this, but it will certainly mean that you are producing energy that isn’t going to be burnt off for a while, and this can be stored in fatty tissues instead. The main effect of eating before bed is that your stomach will need to continue digesting the food once you are asleep. This can cause discomfort in a number of ways. The heat produced during digestion, for example, can make it difficult to maintain a comfortable temperature while you are trying to sleep. Side effects of digestion are also a common cause of people’s inability to sleep. Indigestion and heartburn will be disruptive, and can make it more difficult to doze off and increase the possibility that you will wake up. Late eating will also make it more likely that you will need an early morning visit to the bathroom, preventing you from getting as long of a sleep as you otherwise would. Some foods, like cheese, bacon, and red wine also contain a chemical called tyramine, which subsequently releases a brain stimulant called noradrenaline that will stop you from falling asleep. The final concern that arises when eating just before you go to bed is the fact that your stomach will be working throughout the night. This means that it will not have a chance to rest from its daily activity, and there will be less time for it to repair itself. This will also mean that a constant blood flow will continue to go to that area so there won’t be as much oxygen to divert to the other organs that need it. Eating before bed can lead to a less effective sleep overall. How Many Hours Before Bed Should You Stop Eating? It must be pointed out that it isn’t dangerous to eat before bed, it just isn’t ideal. With this being said, it would be preferable to have given your stomach plenty of time to have at least begun the digestion process of a large meal before you go to sleep. This would mean having your last meal 3 or 4 hours before bed, but by all means have a small snack later on. If you are concerned about weight gain or loss, the time you eat won’t have an effect, but the quality of food you are eating will. You may have heard a number of conflicting theories from various sources about whether you should eat before going to bed or not. If you are looking at when should you stop eating before bed, it won’t matter if your reasons are related to weight management, but for adequate rest overnight it would be preferable to not eat a large meal for a few hours before.